North Korea held a massive live-fire exercise on Tuesday amid escalating tensions with the US. As a “show of force” a US Navy guided-missile submarine arrived in South Korea on Tuesday while the North celebrated the 85th anniversary of the founding of the Korean People’s Army. 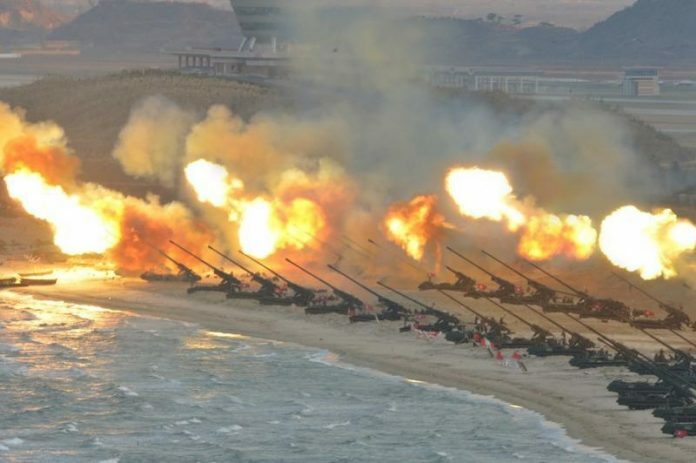 In the largest ever live-fire exercise of its kind, North Korea deployed long-range artillery units in the region of Wonsan on its east coast, 110 miles away from South’s capital Seoul, according to South Korean military. State media reports that Korean People’s Army is prepared “to bring to closure the history of U.S. scheming and nuclear blackmail” in the region. The port call by the USS Michigan, first reported by Reuters, came as the USS Carl Vinson carrier group steamed toward Korean waters and is expected to arrive over the next 24 hours, while top envoys for North Korea policy from South Korea, Japan and the United States met in Tokyo. 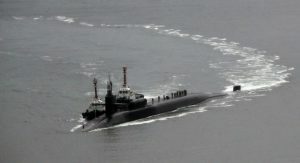 The nuclear-powered submarine the USS Michigan, which arrived in the South Korean port of Busan, is built to carry and launch ballistic missiles and Tomahawk cruise missiles. Some have speculated that North Korea would conduct another nuclear test or long-range missile launch in defiance of U.N. sanctions, perhaps on the Tuesday anniversary of the founding of its military, however the absence of such an event has led to speculation Trump’s hardline tactics, together with pressure from China may have paid off. 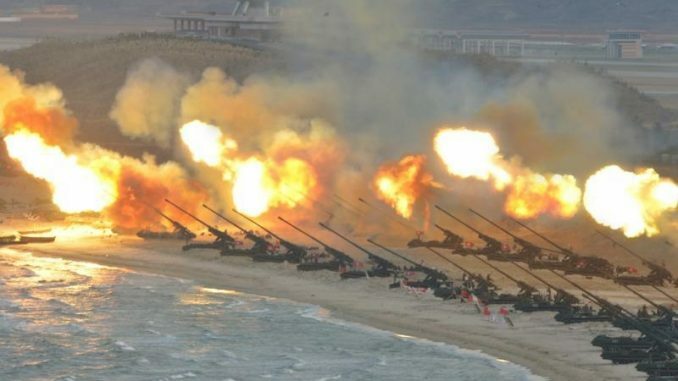 So far, instead of a nuclear test or big missile launch, North Korea deployed a large number of long-range artillery units in the region of Wonsan on its east coast for a live-fire drill, South Korea’s military said. North Korea has an air base in Wonsan and missiles have also been tested there. "North Korea is conducting a large-scale firing drill in Wonsan areas this afternoon," the South's Office of Joint Chiefs of Staff said in a statement. The South Korean military was monitoring the situation and "firmly maintaining readiness", it said. The South's Yonhap News Agency said earlier the exercise was possibly supervised by North Korean leader Kim Jong Un. Meanwhile, North Korea’s state media maintained its jawboning and was defiant in a commentary marking the 85th anniversary of the foundation of the Korean People’s Army, saying its military was prepared “to bring to closure the history of U.S. scheming and nuclear blackmail”. 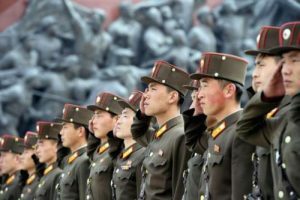 “There is no limit to the strike power of the People’s Army armed with our style of cutting-edge military equipment including various precision and miniaturized nuclear weapons and submarine-launched ballistic missiles,” the official Rodong Sinmun newspaper said in a front-page editorial. Further adding to the pressure on its northern neighbor, South Korea’s navy said it was conducting a live-fire exercise with U.S. destroyers in waters west of the Korean peninsula and would soon join the carrier strike group approaching the region. China, North Korea’s sole major ally which nevertheless objects to its weapons development, has repeatedly called for calm, and its envoy for Korean affairs, Wu Dawei, was in Tokyo on Tuesday. “We hope that all parties, including Japan, can work with China to promote an early peaceful resolution of the issue, and play the role, put forth the effort, and assume the responsibility that they should,” Chinese foreign ministry spokesman Geng Shuang told reporters in Beijing. Japan’s envoy on North Korea, Kenji Kanasugi, said after talks with his U.S. and South Korean counterparts that they agreed China should take a concrete role to resolve the crisis and it could use an oil embargo as a tool to press the North. “We believe China has a very, very important role to play,” said the U.S. envoy for North Korea policy, Joseph Yun. South Korea’s envoy, Kim Hong-kyun, said they had also discussed how to get Russia’s help to press North Korea. Japanese Prime Minister Shinzo Abe is expected to meet Russian President Vladimir Putin on April 27, the Kremlin said. It did not elaborate. Still, despite the lack of a nuclear test or missile launch, clouds are gathering over Pyongyang. The State Department said on Monday U.S. Secretary of State Rex Tillerson would chair a special ministerial meeting of the U.N. Security Council on North Korea on Friday. Tillerson, along with Defense Secretary Jim Mattis, Director of National Intelligence Dan Coats and Joint Chiefs chairman General Joseph Dunford, would also hold a rare briefing for the entire U.S. Senate on North Korea on Wednesday, Senate aides said. A North Korean foreign ministry spokesman said those meetings called by U.S. officials clearly reflected the U.S. pressure that could "ignite a full-out war" on the Korean peninsula. "The reality of today again proves the decision to strengthen nuclear power in quality and quantity under the banner of pursuing economic development and nuclear power was the correct one," the unidentified spokesman said in a statement issued by the North's state media. On Monday, Trump called for tougher U.N. sanctions on the North, saying it was a global threat and "a problem that we have to finally solve". Taking a softer line, the official China Daily said it was time for Pyongyang and Washington to take a step back from harsh rhetoric and heed calls for a peaceful resolution. “Judging from their recent words and deeds, policymakers in Pyongyang have seriously misread the U.N. sanctions, which are aimed at its nuclear/missile provocations, not its system or leadership,” the newspaper said in an editorial.